Very, very few players have covered King Crimson repertoire and no-one of prominence (other than The Schizoid Band and Andrew Keeling’s orchestral arrangements) has attempted more than one or two pieces. There have been honourable renditions & representations but, until now, without significantly adding to my understanding of Crimson material. The CJ3 have respectfully & irreverently taken 8 Crimson classics, repositioned them in the musical spectrum, and delivered their first Songbook with superb musicianship in service to wit & invention. I have heard, as if for the first time, Schizoid, TOAPP, Catfood, Starless, Ladies Of The Road, I Talk To The Wind, Red & Matte Kudasai. Ian Wallace provides personal hotline & Crimson-juice authority to the Trio, although anyone unfamiliar with Ian’s jazz passion & experience may be surprised by what is going on here. O for a shabby & smoke-free jazz club to sit back & savour The CJ3 in living sonic colour. O for someone to persuade Ian, Jody Nardone & Tim Landers to climb into the back of a van and travel. With all manner of jazz musicians reinventing the music of contemporary pop artists today, it’s inevitable that somebody would decide to take a close look at the cream of progressive rock, reinventing it in a more decidedly jazz context. If artists like Brad Mehldau can reshape Radiohead, then why not re-examine King Crimson, a seminal influence? Enter Ian Wallace, drummer for the Crimson incarnation that released Islands (Island, 1971). 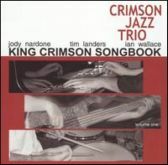 While on tour in 2004 with 21st Century Schizoid Band—a group of ex-Crimson members who relatively faithfully recreate songs from In the Court of the Crimson King (Island, 1969) through Islands, in addition to other like-minded material—Wallace had the idea for reinventing classic Crimson material in a piano trio format. Enter pianist Jody Nardone and bassist Tim Landers—two big Crimson fans—and the Crimson Jazz Trio (CJ3) was born. The group's first release, The King Crimson Songbook, Volume One, is not only surprisingly faithful to the essence of the eight songs it covers, but the general arrangements as well, while shifting them firmly into the jazz mainstream. If there is any criticism of these pieces, it’s that they are almost too faithful. Mehldau sometimes refashions material so that it’s almost unrecognizable; CJ3’s interpretations never stray too far. For progressive rockers coming to jazz, this might be a good thing, but for more seasoned jazzers for whom King Crimson is part of a broader musical continuum, this approach may seem too safe. Despite the fine playing on The King Crimson Songbook, Volume One, one wonders what might have happened had these three players been a little more adventurous and taken the material a little further. Still, there are some surprises to be found. The brightly swinging “Ladies of the Road” is the only song from Wallace’s time with the group. The industrial intensity of “21st Century Schizoid Man” from In the Court of the Crimson King is reinvented first as contemporary lounge music, then moves into a more fiery solo section. “I Talk to the Wind,” from the same album, retains its pastoral beauty, while the bluesy “Cat Food,” from In the Wake of Poseidon, plays it straight, yet manages to suggest pianist Keith Tippett’s free style playing on the original. Landers takes the lead on “Matte Kudesai,” from Discipline (EG, 1981), giving the tune a Jaco Pastorius-like interpretation. The title track from Red (Island, 1974)—a hugely influential song to progressive metal groups like Tool—works best. It clearly references the elements that define the original, but it’s more liberally worked over, with a funky rethinking of the orchestral middle section featuring a powerful drum solo from Wallace. The King Crimson Songbook, Volume One is an intriguing reshaping of material from a band that has always had a tenuous relationship with the jazz aesthetic. If there’s a Volume Two, perhaps more time together will find CJ3 taking more risks with the material, a move more in keeping with the ongoing Crimson spirit of Robert Fripp, the only original member to be involved in every Crimson incarnation. Joe is off school with a very nasty sore throat. We’d noticed he’d been off colour and not quite himself for a couple of days and was complaining that his neck felt “bloated.” Borrowing a torch from Debbie’s bag (don’t ask), I gazed down Tom’s throat just to get a sense of what a healthy throat should look like. Apart from being big enough to drive a bus down it, his pink throat with epiglottis and robust tonsils moved spookily like the jaws of the big alien from Predator when it takes its helmet off after going a few rounds with Arnie. Other than that, it was healthy as could be. Joe’s throat was something else altogether; as narrow and mean as a rejection slip, it was also a disturbing shade of green. The doc has given him anti-biotic to help fight the infection and after spending the day off school his spirits are lifted and restored. Hopefully his bad throat won’t be far behind. And speaking of spirits being lifted, Ian Wallace was on the blower last night telling me he was sending me tracks from the Crimson Jazz Trio. Sure enough, half an hour later I was listening to a pre-mastered version of the album. Debbie was sitting at her desk in the yellow room and after a couple of tracks had been playing said “This is really good.” Now given that Debbie a) hates jazz and b) isn’t exactly a Crim fan, I took this as a mighty compliment. I was impressed myself. You wouldn’t think a piano, bass and drums outfit would do King Crimson’s material justice. It shouldn’t work but it really does and spectacularly well. Jazz has always been capable of transforming material from one genre to another. Part of the success depends on the choice of material that’s being reinvented and in this, The Crimson Jazz Trio has chosen well. The mistake to make when approaching this record is to think of it as a mere covers album. It’s nothing of the sort. Ian Wallace, pianist Jody Nardone and bassist Tim Landers do something subtly different. They’ve produced an album of material that has authority and its own personality equal and in some respects independent to its origins. Rather than meekly attempting to rework some tunes in a different idiom, the Crimson Trio push the material somewhere else entirely. There’s a transformative, liberating alchemy at work here that makes this album so engaging. One is never quite sure which direction a particular piece is going to go next. Given the empathy for the jazz tradition that resided in Crimson (especially in the early part of their career) it perhaps should be no surprise that the project is as successful as it is; how else does one explain that these rock-based tracks sound like they’ve found their spiritual home? Be warned though. Those who like their jazz caustic, angular and abrasive will be disappointed. That’s not to say the music here is without sparks. Far from it. However, the trio have chosen to emphasise and explore the richly melodic themes that have always flowed through King Crimson’s music. This is due in part to Nardone’s expansive approach and a wry piquancy that reminded me of early Chick Corea before he entered the pitch-bend purgatory of Return To Forever’s more grandiose workouts. On I Talk To The Wind, Nardone’s romantic flourishes are not unlike that other Miles Davis alumni, Keith Jarrett. Three Of A Perfect Pair is beautifully realised as an introspective reverie with a gorgeous solo from bassist Tim Landers that stylistically wouldn’t be out of place on an ECM release. Here, Jody Nardone has chops to spare, cranking up both pace and tensions no end, piling chords up on top of each other as the track sways alarmingly in the middle section. Throughout the album, Wallace’s playing has a heat-seeking intensity whether is it be the tiny details of his brush work on Schizoid Man or the explosive stoking that adds to the poignant fire of Starless. Red too moves from being a snarling beast to become something diaphanous and soaring though still capable of delivering a bite or two. Those raunchy Ladies of the Road have become rather more refined and sophisticated society babes with the passing of the years but still capable of providing a hot date when needs be. Matte Kudesai’s plaintive melody is given a refreshing new context that is both wonderfully light in its touch and deeply moving. Here Nardone and Wallace give a rhapsodic Landers the space to turn in one of the albums stand-out performances; his eloquent playing is joy throughout. And if their playful rendition of Cat Food, (with its guest vocal from Haagi the dog) doesn’t make you smile, then you must have had your mirth muscle removed.